Morning Crafty Peeps, There is a new challenge over at Delightful Challenge. The theme for this challenge is (Make it Simple), my image is Thank You Flower Pot, which you can find in the store. We have a wonderful Sponsor this week, so come and join the fun and play in our challenge this week. Morning Peeps, Charlene is the hostess for challenge #86 over at DS4J. The theme is: "Embellishments using Dies or punch. I created with the image "Poppies." So jog on over and come play with us. Supplies: scrap paper, silhouette leaf die, Marianne flourish and border die, Elizabeth Craft butterfly die, and colored with spectrum noir alcohol markers. Morning Peeps, Tuesday Throwdown challenge #184, is sponsored by Cute 2 Ink. The theme is " Anything Goes." I created with "The Cowboy" digi. I just love the expression on his face. It is priceless. Supplies: Simple Stores say cheese paper, DIY shop cork stars, burlap, K & Co sticker, Colored with spectrum noir markers. Morning Peeps. Facebook February challenge Art by Miran. The theme is" Make It Girly. Hello Crafty Peeps, Welcome to the Greetings challenge, hosted by Chana, over at the Outlawz. Challenge #8 with the theme: Anything Goes, Our sponsor is MelJens. Evening Peeps, There is a new challenge blog over at The EastWind. The first challenge #1 theme is Love. They have simply fabulous digis from Unky too. Here is the freebie Aurora for the Chinese New Year, which I am also using for the Love theme. Supplies: Scrap paper, Graphic 45 Bird Song paper, pearls, Marianne border die, colored with spectrum noir alcohol markers. Hello Crafty Peeps, This week's challenge #PS86 is over at Pattie's Creations Design Challenge. Our theme is "Spots or Dots, somewhere on your creation" I created with "Allie and a Pot of Gold" You can find this image at Pattie's Esty shop. Supplies: Reminisce paper, reminisce shamrock stickers, RRR, colored with spectrum noir alcohol markers. Morning Crafty Peeps, There is a new challenge over at Delightful Challenge. The theme for this challenge is (add a Flourish), my image is Forgetful Fran, which you can find in the store. We have a wonderful Sponsor this week, so come and join the fun and play in our challenge this week. Morning Crafty Peeps, The theme for this challenge is (wearing green - somewhere on the card. My image is St. Patrick's day Larry Topper and Top of the Morning sentiment, which you can find in the store. We have a wonderful Sponsor this week, so come and join the fun and play in our Delightful Challenge this week. Morning Crafty Peeps, There is a new challenge over at Delightful Challenge. The theme for this challenge is (Love Notes, hearts, musical note), my image is from Valentine Topper, Bear Topper, which you can find in the store. We have a wonderful Sponsor this week, so come and join the fun and play in our challenge this week. Morning Peeps, Karin is the hostess for our "Add a Heart" challenge #85 over at DS4J. So jog on over and come play with us. I created with the image "Vase of Hearts." Authenque paper, bazzill paper, SFL cling sentiment, queen & co heart bling, SU Raspberry swirl ink, and colored with spectrum noir alcohol markers. Morning Peeps, Tuesday Throwdown challenge #182, is sponsored by Simply B Stamps. The theme is " Roses are Red, Violets are Blue." I created with "I love you, Oscar" digi. I just love the expression on her face. It is priceless. Colored with spectrum noir markers, used all Bo Bunny products on this card. 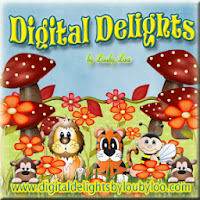 Morning Crafty Peeps, First Thursday of the month are New Releases over at Delightful Challenge. The theme for this challenge is (Anything Goes), my image is Cheerleader, which you can find in the store. We have a wonderful Sponsor this week, so come and join the fun and play in our challenge this week. Hello Crafty Peeps, Welcome to the Greetings challenge, hosted by Nancy over at the Outlawz. Challenge #5 with the theme: (Thank You), Our sponsor is Fred She Said. Supplies: KaiserCraft, Tigerlilly paper, RRR, queen & co bling, Tim Holtz die, SFL cling sentiment, precolored Fred She Said Dogwood flower digi.